I was looking for a movie which I could see this Saturday while my wife was having an event and I decided to see this Indonesian film which premiered since last Thursday. It was a thriller movie that was promoted in Cannes Film Festival. The premise seemed interesting and it was categorized as thriller movie. So when my wife was being a host to the event at Grand Indonesia mall, I went by myself to the cinema there and saw this one at 11.30 AM show. Well let us get on with the movie now. Marlina (Marsha Timothy - The Raid 2, Nada untuk Asa etc) was a woman who just lost her husband and having huge debts to settle. She lived in a house in the middle of a dry land in Sumba. One day a person whom she owed to named Markus (Egy Fedly - Pengabdi Setan, Ular Tangga etc) came to her home to gather Marlina's cattle for paying her debts. He warned her that there would be 6 more persons coming to collect her debts and the seven of them would also enjoy the pleasure of her body. Marlina was shocked to find out about this fact and she thought of a way to escape from these bandits. On the following day, Marlina who indeed managed to escape from the clutches of these men, was planning to go to the police to report the crime. She met with her neighbor, a 10 month pregnant woman named Novi (Dea Panendra). 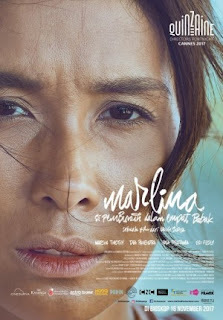 Novi was going to see her husband Umbu (Indra Birowo - 3 Srikandi, Galih dan Ratna 2017 version etc) in the city and she was curious of Marlina's mental state as she was bringing with her something that was highly not ordinary. Novi wanted to help Marlina after she found out what happened to her, but she also had her own challenges especially with her pregnancy overdue. The journey to the police station was very tough on Marlina as she had to endure the difficulty of getting a ride, not to mention that she was being pursued by Franz (Yoga Pratama - The Window, 3 Doa 3 Cinta etc) and his friend Nico (Haydar Saliz - Siti etc) due to her actions the night before. So could Marlina safely escape from this pursue and could she convince the police to take action? Could Novi help Marlina? Find them all in this drama thriller movie. I think this was the first time I saw an Indonesian movie specialized for festival in a theater. So I already prepared myself to be seeing a heavy movie. And it was a good thing that I came prepared since the movie felt very unique. The movie was made into 4 parts which explained the title (English title of this movie was Marlina: The Murderer in Four Acts). Each act had its own title which represented the act's story/plot and the subsequent acts were having a continuity with the previous act till sort of the climax in the fourth act. Being a festival film, I could understand why it was highly appreciated, especially with the visual take of the barren & dry but lovely land of Sumba and the very good acting of Marsha Timothy. She was really convincing playing the role of a widow having to endure such bad experience and to fight her way to save herself. In addition to her acting, I think the ones that stood out were Dea Panendra who surprisingly gave a good performance in what I think was her acting debut. Oh the girl who played the role of Topan in the third act was also very good. Too bad I could not find out her name. The movie did not have a lot of dialogues but the director Mouly Surya who won the best director award in 2008 Indonesian Film Festival for her movie Fiksi... (which also won the best movie and best writer on the same year) let the body language and the slow moving scenes did the talking. You could feel the intensity in the first act, the more fun with a touch of brief humor in second act, the sadness & pity in third act and the satisfaction in the final act. After watching the whole movie, I really believed that this movie was definitely for adult audience. There were some scenes and conversations which were only suitable for the mature people. One thing is for sure though that this movie was truly a Festival oriented movie. I do not think this movie would appeal to the general audience due to the uniqueness, the very slow pace, the countless non conversation scenes. I personally felt that some of the scenes, despite looked beautiful, took too long and the slow pace was the part that made me, sorry to say, a little bit bored. The whole 1.5 hour movie felt like a 2 hour due to its slow pace. But again, do not get me wrong, this is no doubt a good movie and a critical darling (rotten tomatoes score 86). However, did I totally enjoy the movie? The answer would be: Not Really. It was an interesting movie, though not the most enjoyable movie for me personally. I did love the ending of the movie which was pretty satisfying. So if you are a fan of this kind of movie or if you are not, but just want to see why this movie was highly valued, then you definitely should see this one. However, if you are a casual movie audience who just want to see movies to be entertained and feel entirely happy but not overly fatigued after you saw the movie, then this one should totally be avoided. The choice is yours.